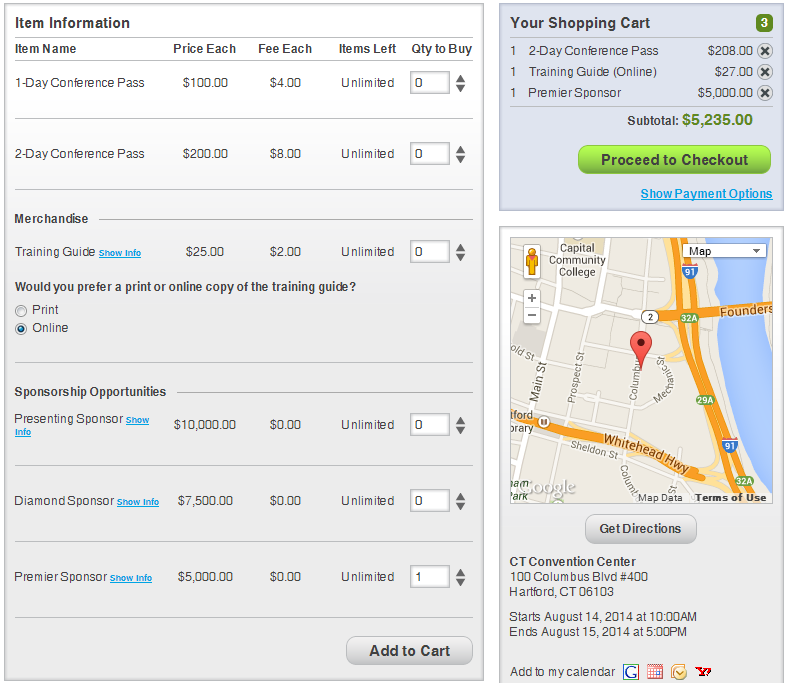 If you’re looking to attend an event, it’s simple to find, purchase, and print tickets on ezEvent®! To obtain tickets to one of the events listed on ezEvent®, visit the event page by either following a direct link to the page or searching for the event using our Find Events link. On the event page you can use the fields within the Ticket Information box to select the type of ticket you would like and the quantity you require. To adjust the quantity, click the up arrow to increase the number of tickets and the down arrow to decrease the number of tickets. You can also type the number of tickets you would like into the text box under the Qty to Buy column. 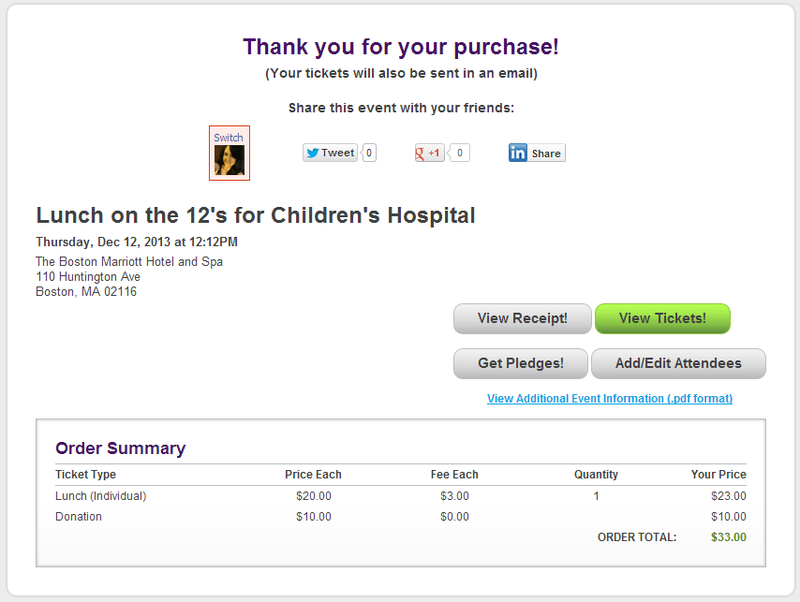 There are also other ticket types, including Donation Only (No Tickets), Donation With Tickets, and Merchandise. These options all use the standard checkout, although Donation Only (No Tickets) does not provide the buyer with an entry ticket. To enter in a donation amount, type the number in the text box under the Price Each column. For merchandise items, you are able to select options such as Quantity, Style, Color, and Size by using the provided dropdown menus, radio buttons, and up/down arrows. Once you have selected the quantity of tickets and/or items you want to purchase, click the Add to Cart button. All of the items you select will be added to Your Shopping Cart on the right side of the page. A summary of the items you’ve put in your shopping cart is listed under the Apply Coupon Code link. If you decide you no longer want to purchase one of the items in your cart, click the button with the X in the row with the item you want to remove. A Subtotal for your order appears under the summary of items in your cart. If you’re set with the items you want to purchase, click the green Proceed to Checkout button. If you are unsure about anything during the checkout process, you may contact the host for further information by clicking the Email the Host! button in the Contact Information box on the event page. In Your Shopping Cart you’ll also find a link that says Show Payment Options. This provides the full list of payment options, that you will choose from during checkout. If an event organizer has used our Customize advanced options to include Attendee Information before checkout, you will be prompted to enter in some information about yourself. This information may include First Name, Last Name, Email Address, Phone, Street, City, State, Zip, or any custom questions the event organizer has included. Be sure to fill in any required information (as noted by an asterisk). If an event organizer has used our Customize advanced options to include waivers, you will need to sign before moving on to checkout. 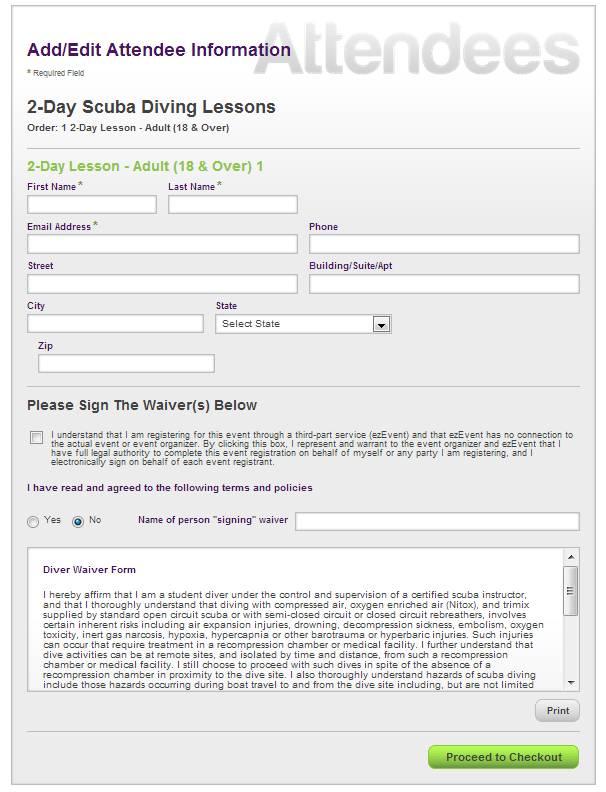 Read through the waiver and make sure you are ok with the content. If you agree to it, click the radio button next to the Yes option and then type your name into the text box to the right of 'Name of person “signing” waiver'. A print button is available if you would like to have a hard copy of the waiver. Click the green Proceed to Checkout box to continue with the checkout process. When you get to the Checkout page you will find a summary of your order in the Your Order ($USD) box. This summary will list each Ticket Type, Donation, or Merchandise selected along with the Price Each, Fee Each, Quantity, and Your Price. Your Order Total will display below this list. Tickets that are free will display $0.00 in all price fields. If you have a promo code you can enter it in the Promo Code box and press the Apply button to apply the discount. ezEvent® offers event organizers several different buyer payment options, including credit card processing through the ezEvent® Merchant Account and PayPal, or offline options such as Pay by Check, Pay by Invoice, and Pay at Door. The Payment Options selected by the event organizer will appear the in Please Choose How You’ll Pay box on the Checkout page. Click the radio button to the left of the Payment Option you would like to use. When an option is selected, the screen will adjust so that the information you provide is appropriate to the payment type. ezEvent® Merchant Account – The ezEvent® Merchant Account is our default Payment Option and is used if you would like to pay by credit card. When you choose this payment type, you are required to enter your First Name, Last Name, Street, City, State, Zip, Country, and Phone. You also need to include your credit card information, including the Credit Card Number, Expiration Date, and Security Code. ezEvent® accepts American Express, Discover, MasterCard, and Visa. Credit card information is processed securely, and ezEvent® does not store credit card values. If your Order Total is $0.00, you will not be prompted for credit card information. PayPal – Choosing the PayPal option will require you to exit ezEvent® and complete checkout on PayPal. After selecting PayPal as your payment option, click the Check out with PayPal button at the bottom of the page. When you get to PayPal you will be asked to provide your First Name, Last Name, Address, City/State, Zip Code, Phone Number, Email Address, and billing information. 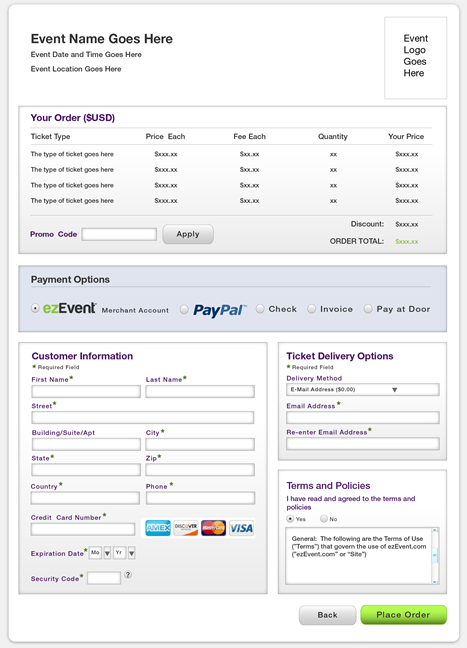 Once you have submitted all of your info, you will be redirected back to ezEvent® to complete checkout. Check – Choosing the Check option requires you to send your payment in the form of a check. When you choose this payment type, you are required to enter your First Name, Last Name, Street, City, State, Zip, Country, and Phone. At the bottom of the Customer Information box you will find Pay By Check Instructions, which will tell you who to make the check out to and where to send it. Invoice – Choosing the Invoice option means that the event organizer will send you an invoice for your order. When you receive the invoice you will be required to send the event organizer payment. When you choose this payment type, you are required to enter your First Name, Last Name, Street, City, State, Zip, Country, and Phone. At the bottom of the Customer Information box you will find Invoice Instructions, which will give you more details about the invoice you’ll receive and how to handle payment. Pay at Door – Choosing the Pay at Door option requires you to pay for your order when you arrive at the venue on the date of the event. When you choose this payment type, you are required to enter your First Name, Last Name, Street, City, State, Zip, Country, and Phone. At the bottom of the Customer Information box you will find Pay at Door Instructions, which will tell you how to handle the payment when you arrive at the venue. The Event Organizer has the ability to decide if you receive your tickets upon registration or after payment is received. The Delivery Method for all Ticket Types is via email. To receive your order, enter your Email Address in the appropriate fields. To place your order you must read and accept our standard Terms and Policies, which is located below the Ticket Delivery Options box. To accept the Terms and Policies, click the radio button to the left of the Yes option. After agreeing to the Terms and Policies, you may click on the green Place Order! button to complete your order. View Receipt! – The View Receipt! button lets you view and print a receipt of your transaction. It includes Event Information, Billing and Payment information, and an Order Summary. View Tickets! – The View Tickets! button lets you view and print the tickets that were purchased. Remember to bring these printed tickets to the event for admission! If the event organizer has elected to hold tickets until payment is received, the View Tickets button will not be visible until the organizer has updated the order. Add/Edit Attendees – The Add/Edit Attendees button appears if the event organizer has chosen to collect Attendee Information. This button allows you to submit or make changes to any information that the event organizer requires from you. Get Pledges! – The Get Pledges! button is used for Pledge events that require participants to get donations. The Get Pledges! page provides a link to a Pledge Web Page unique to the ticket buyer that can be shared to collect donations. There is also a text box provided where the buyer can type in a Message to Pledges. If the event organizer provided instructions for the Payment Option the buyer selected, those instructions will be visible underneath the Event Information.